Set to take off on holidays with the kids in tow soon? Then this is a must-read for you. I’ve travelled a lot with my daughter on planes and keeping her entertained and happy is goal number one. In doing that, I’m quite often wrangling with wayward toys and colouring-in accoutrements that are flying every which way. Not to mention the up and down fiddling about in the overhead compartment retrieving requested play items. So I’m very excited about the TrayKit, which I think will answer all of our flying-with-a-child woes. The TrayKit is just a cute backpack at first glance, cleverly hiding the genius that lurks inside: pockets and nooks galore to hold all of those little items (crayons or pencils perhaps? 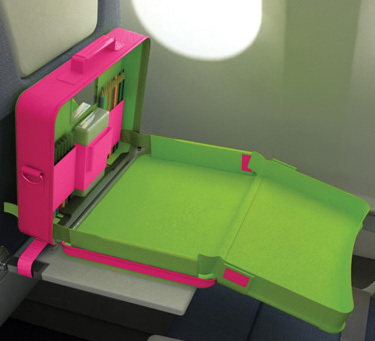 ); an extendable play surface with raised sides to keep everything in place (no more rolling toys); and of course it can be securely strapped to the plane tray table. 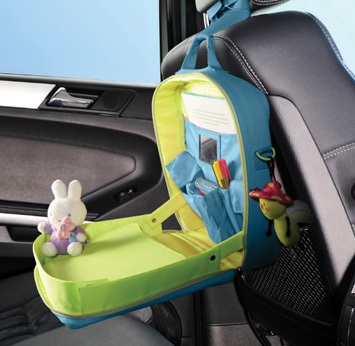 You can also use it in the car – it easily hooks over the headrest of the front seats – to keep those cries of “are we there yet” at bay during family road trips. To order the TrayKit for your little frequent flyers, go to Content & Calm where it’s priced at £24.99 plus £4.99 postage to Australia. The site features all of the products designed and made by one Mum (including the TrayKit) so make sure to have a browse. Editors Note – postage had increased to £46, not £4.99 as stated above.